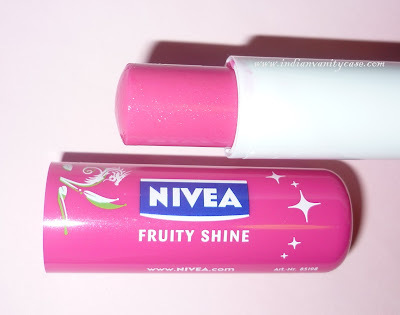 My lips are loving these two Nivea lip products right now. Nivea Pinkish Boost 3 in 1 enhances natural pinkish tone of your lips. The innovative formula contains Pinkish Vitamin Complex and regenerative Ginseng which enhance the natural pinkish tone of your lips. SPF 15 helps to protect your lips from further darkening. Double moisturiser enriched formula provides 8 hour long moisturisation. What is Nivea Fruity Shine? 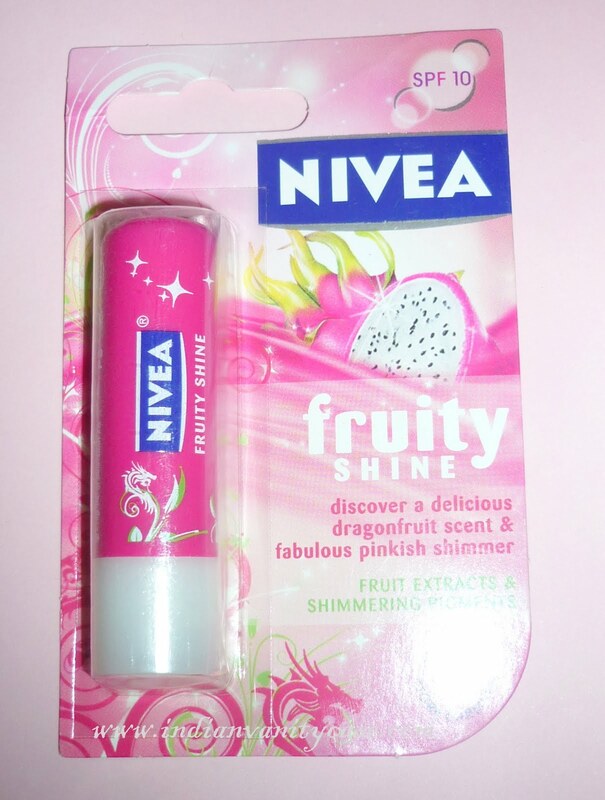 The innovative formula of Nivea Fruity Shine with Fruit Extracts and Shimmering Pigments provides long lasting moisturisation and an exciting Dragonfruit flavour, giving you soft and smooth lips with fabulous pinkish shimmer. Contains SPF 10, protection against UVA and UVB rays. I've wanted to try this ever since Tanveer did a review on it, but I only managed to get my hands on it recently. 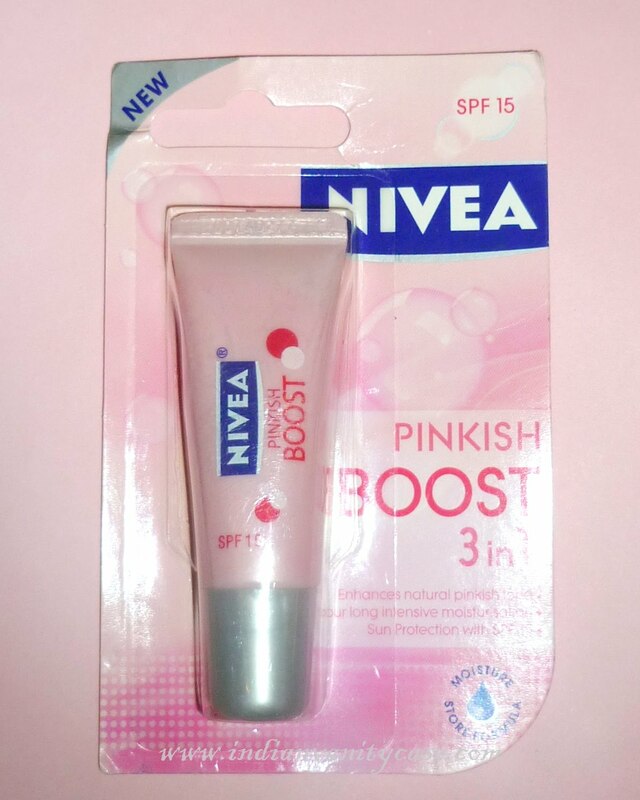 Nivea Pinkish Boost looks clear on the lips & Fruity Shine gives a very natural sheer glossy pink. I like that they both have SPF and both of them are very very moisturizing. Tried them yet? If not, I recommend the Fruity Shine one. Thank you for the review on the Nivea product. My lips are chappy all the time. I will definitely try out this product. Didn't know there are two of these - I guess I never pay enough attention! I really wanna try both!! love the color!! I want to try it! !Thanks for sharring! !Now I'm going to! I've been using the Fruity Shine in Cherry flavour and love it. The dragonfruit one looks gorgeous. I've used both of these. Pinkish boost is okay whereas i could feel the gritty glitters when i purse my lips while wearing dragonfruit. but i still love it. fruity shine in strawberry is another beautiful color. @Tanveer ~ Oh yes..U can surely link this post girl. 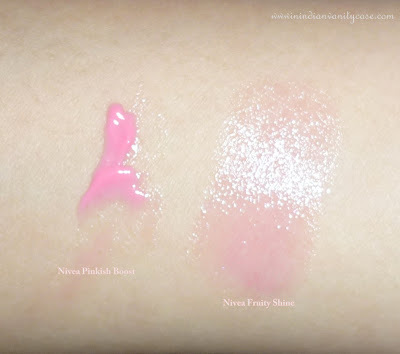 I have seen the Nivea Pinkish Boost..Will pick it up next time. The colors are lovely I like the Nivea lip care a lot.the product really looks well after the lips and keeps it away from drying and getting chapped. can I ask you, what colour is that NYX tinted lip spa?? i have been using dragon fruit for 2 months now and i love it! but really wanna try pinkish boost but am wondering whether to or not. my biggest issue is that i'm a smoker so half my balms get transferred to my cigarettes!! what to do?? ?